If you’re new to WordPress, bbPress and BuddyPress can be quite confusing. The fact that they both begin with the same letter and end with Press, make it difficult to remember, the use of each plugin. (Okay so may be the word ‘Buddy’ is a clue ? ). bbPress is a plugin to create forums, while BuddyPress is a plugin used to create a intimate social network. Both plugins provide communication platforms, using which people or groups can freely exchange ideas, discuss topics, ask questions, and so on. Basically, to draw more visitors and registered users on your WordPress site, by inducing a sense a community. To provide you with an overview, let’s take a look at the features of each plugin. To begin with, let’s state a few facts which are common to both these WordPress plugins. Free: Both plugins are open source and are free to use! Platform: PHP and MySQL. No surprises there. Well, that list was short! That’s because these plugins have been built for different purposes, but are usually used in conjunction with each other. Moving on. We’ll evaluate the differences between the two. Usage: As mentioned, bbPress is a forum software, while BuddyPress is a social networking plugin. Forums provide you with a platform to receive comments, set up topics for discussion. If this sounds like something you need, bbPress is the plugin for you. However, if your requirement, is to have a platform, where users can create groups, exchange messages, then BuddyPress is the plugin you need. BuddyPress provides advanced communication tools for user groups. 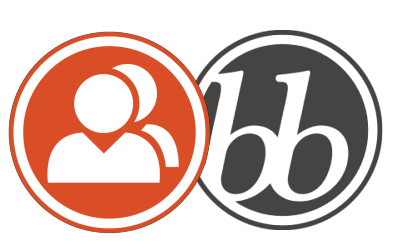 Add-Ons: BuddyPress has over 500 add-ons, whereas bbPress has around 200. What does this mean to you? BuddyPress probably has readily available add-ons for features you need. While bbPress has limited (yes 200 is comparatively fewer). It also means, means BuddyPress is a highly popular plugin, hence several add-ons have been built. Performance: If you had to compare both plugins, to add forums into your WordPress website, BuddyPress would be comparatively slower, because it has a lot more features, and it loads all of them. bbPress is a lightweight plugin. Ease of Use: bbPress is fairly less complicated as compared to BuddyPress, when it comes to setting up the plugin. But that is because bbPress has limited features. But when you think about it, social networking websites have forums as well. 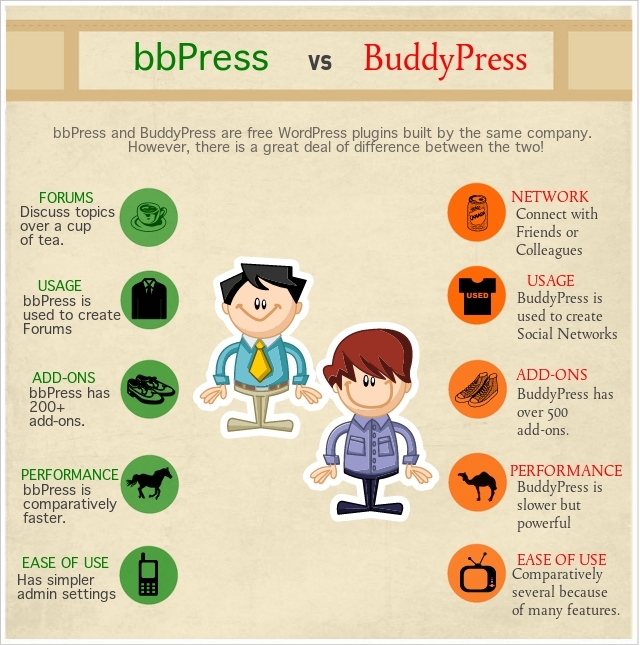 And since BuddyPress uses bbPress for forums, you’d need both the plugins on your site. When integrating the two, many users often have a doubt, regarding which plugin, they should install first. But, since both plugins are different, you could install either plugin. They are in no way dependent on each other. If you deactivate one plugin, the other works seamlessly. So folks, let me know your views and questions about these plugins. Which plugin do you think suits your use case better?